I mentioned before that this 150th anniversary of the Civil War has persuaded me (and many other historians and reenactors) to contemplate, study and follow the war in “real time.” Each day, I give some thought as to what was taking place on the same date 150 years ago for the 22nd Massachusetts (the unit represented by my group of reenactors) and the Army of the Potomac as a whole. As this spring and summer of “1862” progresses and one considers the army’s activities from day to day, it provides a very realistic temporal sense of the tedious pace of the Peninsular Campaign…the long periods of inactivity and the many ways in which things went wrong. There is a lot that I don’t understand (and frankly a good deal that I don’t like) about McClellan. Up towards the top of the list is his complete inaction at Harrison’s Landing. It is very easy to point fingers and play “if only.” This sort of Monday morning quarterbacking might make for interesting debate around the campfire at reenactments, but, to really understand historical events, you have to get beyond the blame game. Understanding McClellan and the Peninsular Campaign is not so much a matter of pointing out what went wrong and the bad decisions that were made. The more difficult part, and the more useful part, is to understand why leaders like McClellan felt they were making good choices…or, perhaps more accurately in this case, why they felt confined and impeded from doing anything at all. 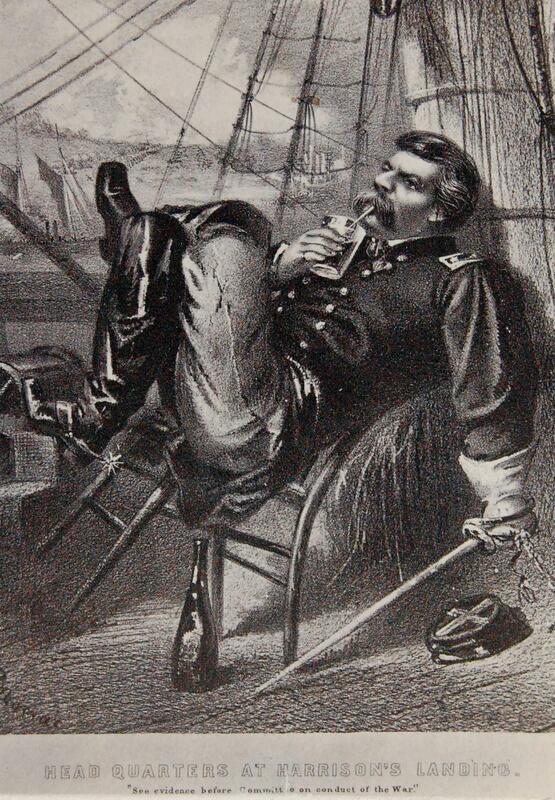 So why did McClellan make such perplexing choices at Harrison’s Landing 150 years ago this month? And, consequently, why did this final chance to make something out of the Peninsular Campaign slip away? A little context first. By July 1862, the Army of the Potomac had been badly beaten. In the previous months, McClellan had brought his massive army to the very gates of Richmond. Then came the turning point in the campaign: the Seven Days Battles. Robert E. Lee, having recently taken command of Confederate forces in Virginia, launched an offensive that rapidly pushed the Army of the Potomac away from Richmond. Just two days into the offensive, McClellan put his army in full retreat or, as he referred to it, executed a “change of base.” “If any army can save this country,” McClellan said, “it will be the Army of the Potomac, and it must be saved for that purpose.” In a series of battles, almost all of which, ironically, were tactical victories for the Army of the Potomac, McClellan continued to pull his army back until it was entrenched at Harrison’s Landing. In this location on the James River, McClellan had the backing of the Union Navy and the means to get much needed supplies to his army. So, McClellan had utterly lost his nerve. And that explains the Seven Days. But after regrouping at Harrison’s Landing, his army still a huge, viable fighting force just 25 miles from Richmond, why, oh, why did he sit there for a month and a half doing nothing? The answer is complicated. One factor, raised by Bruce Catton in volume one of The Army of the Potomac, is the fact that McClellan still did not have the nerve to fight. Predictable. Many historians have talked about the fact that McClellan cared about his army too much and did not want to put them in harm’s way. But Catton puts a slightly more pathological spin on this particular character trait which I find intriguing. McClellan, he writes, had “a deep, instinctive shrinking from bloodshed and suffering, an emotional reaction to the horrors of the front lines.” This is why the general was always found far from the actual fighting and himself wrote, “every poor fellow that is killed or wounded haunts me.” It is possible that McClellan had psychological issues that prevented him from using his army. Another issue, emphasized by James MacPherson: the camp at Harrison’s Landing was rife with disease. One quarter of all unwounded men were ill, according to MacPherson, and this certainly would have hampered any offensive. While I agree that this must have been a factor, I wonder if the stats as far as sick lists during any other campaign were all that different. Other generals seemed capable of working with what they had. The main factor to which many historians point: politics. The political entanglements which kept McClellan paralyzed at Harrison’s Landing were primarily the result of his so-called “Harrison’s Landing Letter.” On July 8, 1862, just six days after the Army of the Potomac dropped down at Harrison’s Landing, President Lincoln visited the site to discuss the future of the campaign with McClellan and to inspect the troops. It is said that McClellan supplied Lincoln with an undersized horse during the inspections to make the lanky President look foolish. When Lincoln first arrived, McClellan handed him a letter written just the day before. It dealt not so much with military matters, but with McClellan’s strong feelings as to the political handling of the rebellion. Lincoln did not comment on the letter at the time. But it caused him to lose any remaining confidence in McClellan. The general had already demonstrated that he was a poor commander in the field. Now he had demonstrated that he would oppose the war strategy to which Lincoln was increasingly gravitating. By this time, Lincoln had already made up his mind on implementing an emancipation proclamation as a war measure. And he was coming to understand the need for a more aggressive policy in executing the war…something that would eventually become the “total war” philosophy and something which McClellan could never have stomached. The day after Lincoln returned to Washington, he named General Henry Halleck general-in-chief instead of McClellan. Lincoln had been considering reinforcing McClellan so that the Peninsular Campaign could be continued. To Lincoln, that was now out of the question and he would place his trust in General John Pope who would open up a new campaign with a new army. McClellan was finished…at least for the time being. Outraged, McClellan telegraphed Secretary of War Stanton, “If I save this army now, I tell you plainly that I owe no thanks to you or to any other persons in Washington. You have done your best to sacrifice this army.” It is amazing that this message did not result in McClellan’s court-martial.